Who doesn't love the warmth and unconditional love from a beautiful four legged furry pet? If you love dogs, and I mean, really love dogs then you can be part of a rewarding experience. Our exclusive Pet Therapy Program is currently looking for chaperones. 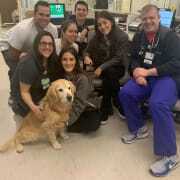 We have committed pet therapy handlers who bring their trained and certified dogs to the hospital to visit our patients. As a chaperone you will be . . .
- escorting the handler and dog to the patient floors on various units. - engaging and interacting with our patients & families and wonderful caregivers. - provide hand sanitizer to all who pet the dog. - greeting patients and introducing the pet handler and pet therapy dog. - able to commit to one day a week for a maximum of 2 hours, usually not more than an hour. The presence of a dog in a hospital setting allows the patients to feel more at home, as they do play a small part of the healing process. The immediate gratification you will see on the patients' and staffs' faces when they are interacting with the dog is truly amazing. There are known benefits for pet therapy visits . . .
- lets patients reminisce about their own animal. Please be advised that we are no longer seeking volunteers for this program at this time.